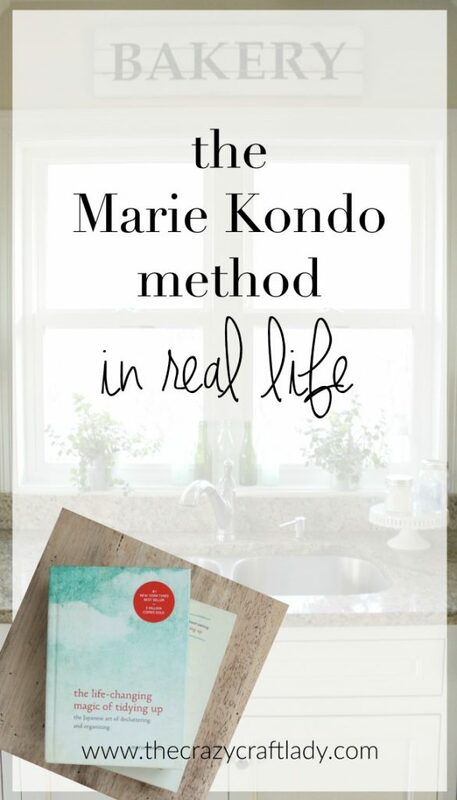 After sharing a few posts on “The Life-Changing Method of Tidying Up,” I thought it was time to share how I’m using the KonMari method to tidy up in my own home. UPDATE: I wrote this post back in 2016, and have since updated as I have continued on my journey to keep my life clutter free and joyful. Learn from my successes (and some failures) with the Konmari method. Here are my Marie Kondo tips for real life. No, I haven’t mastered the KonMari method. No, I don’t plan to. 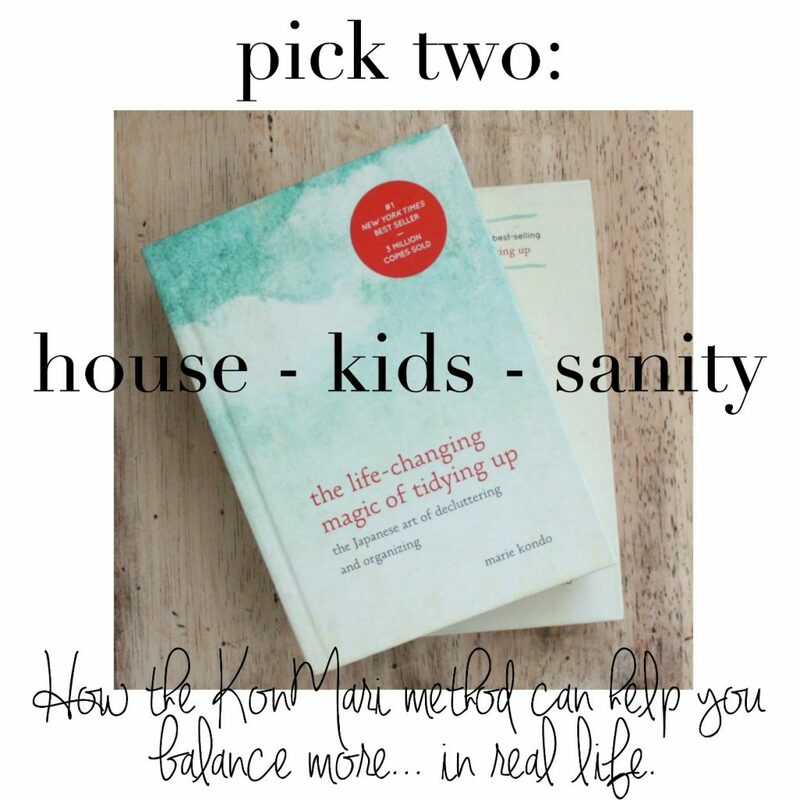 As I read The Life-Changing Magic of Tidying Up and followed the KonMari method, I felt like I was in a yoga or aerobics class that was above my head. Sometimes you just need to do a modification. The KonMari method is the gold standard. Marie Kondo herself even makes a case for aiming for perfection. Of course, I could do everything that Marie Kondo talks about in her book. But I live in the real world – kids, work, and this little blog that I like to update with posts like this one every now and then. We all live in the real world with our own obligations that probably come before keeping a perfectly tidy home. 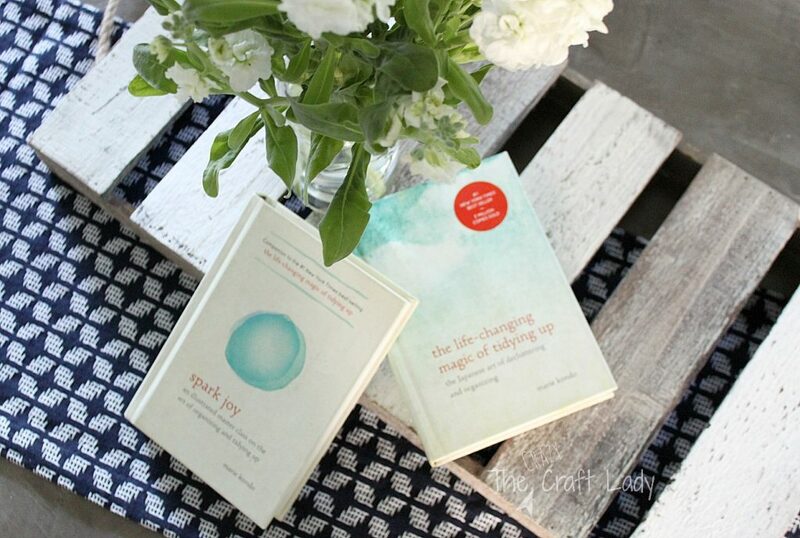 I still highly recommend reading The Life-Changing Magic of Tidying Up and Spark Joy. Of course I do. We should all have something to aspire to. But as long as you’re living in the real world with me, here are some of my modifications that can help you keep your home tidy enough. It’s not like my three-year-old twins don’t do this for me every day anyway, but please Marie. Ain’t nobody got time for that. This is actually a really good idea, and it’s something I need to do a better job of. Once a week is good enough for my needs. I’m trying to get into a better habit of cleaning out my purse once a week – on Sunday evening before I start a new week. This is also a great time to audit new paperwork that came in during the week: mail, school papers, receipts, etc. I keep a small basket in the living room as a “catch-all”. Then I’ll reward myself with some Netflix and paper sorting. I’ll scan, sort, and handle paperwork all at once with The Office playing in the background for the 10th time. What if you Can’t Tidy all at Once? She tells people to pile all of their clothes on their bed – all of them – before you begin to sort through and tidy them. When I first read this advice, I had 3-year-old twins at home, and I knew that this would be a recipe for disaster! So you may have to adapt for what works best for you. The biggest takeaway here is this: Tackle one category or room at a time. Not your whole house. The KonMari method has you tidy by category, so technically you can tidy over the course of a year and stay true to the method. And this is how I’ve had to do things. You can tidy ALL of your clothes, a little bit each night after the kids go to bed, but you may have to pile everything someplace other than your bed if you still want to be able to sleep at night. That’s ok! Set your own timeline. Set achievable goals and milestones, and don’t skip ahead! Even if you’ve completely tidied your whole home, you can’t become complacent. What brings you joy may change over time. Something that brings me joy today, may not bring me joy next year. I plan to do a “tidy audit” once a year or so, to prevent myself from regressing. Ok, Marie. You have never had twin babies, a cartwheel offer for diapers, a Target sale, AND a coupon. Just sayin’. Also, some of our favorite foods come from Trader Joe’s (hello orange chicken and shredded soy cheese! ), but TJ’s isn’t exactly close to our house. I’ll stock up on a Trader Joe’s run about 6 times per year. There’s something to be said about limiting your stockpile. Just keep it organized. We have a small freezer and a large cabinet in the laundry room. If my stockpile of extras can’t fit in this limited space, then my stockpile is too large. The KonMari method recommends not swapping out your clothing with the seasons and keeping all of your clothes in your closet. Well, I live in the great state of Minnesota, where temperatures can range from 50-below zero (windchill… brrr!) in January to 90+ in August. I put my heavy winter jackets and scarves away for the summer, and I put my shorts and sandals away for the winter. BUT I limit it. I have one large container. That’s it. There’s no semi-annual swap-out with a half-dozen Rubbermaid containers. There’s just one. That’s my “crazy Minnesota weather – why do I still live here” compromise with Marie Kondo. Finally… let’s talk about what we wear around the house. Lord help the person who tries to get between me and my yoga pants. Don’t even try. It’s never going to happen. My leggings and ratty law school hoodie bring me joy, and you I’m just fine with that. Ok, friends. I’m going to get really honest with you for a minute. I completely fell off the organizing wagon in 2018. I fell hard. How did it happen? I blame our house. After we moved, I quickly tackled some pretty bog house projects, and getting organized took a back seat. You really need to live somewhere at least 6 months before you can truly tackle any real organizing projects. Why? Because you need to live in the space before you can understand how you need the space to work for you. The workflow that works best in space will determine how and where you store different items. That doesn’t mean you should live out of boxes for 6 months. It just means you can cut yourself some slack on feeling totally settled right away. We moved from a 2-bedroom/1-bath home to a 5-bedroom/2-bath home, and I’m still figuring our how I want our space to work for us. It’s a process. So… I’m starting all over again. I just worked through all of the clothes in our home, and the kids are now in charge of sorting our books. I will gradually work through the rest of Marie Kondo’s 5 categories (Clothing, Books, Papers, Miscellaneous Items, Mementos) throughout the coming months. Stay tuned for my tidying journey in our new home! I’ve not read the book yet but as someone who can get overwhelmed with organization goals, this post resonates! Love your modifications! Can’t wait to read the book! Yes! I just finished reading the Life-Changing Magic and have started tidying with the KonMari method. Going through my clothes and books were easy but now that I’m about to start the “paper” category I’m starting to have my doubts about her fail-proof methods. I also have kids (three actually) and even though they’re a little older than yours, it is still so hard to clean with them around. By the time I get off of work (legal assistant, so I totally get your disagreement on the paper issue), pick up my oldest from practice, and arrive at home it’s time to get dinner ready. And since my two younger kids (ages 7 and 8) tear through the house unsupervised after school (we live in an attached duplex with my in-laws so my kids basically get to do whatever they want until my hubby or I get home), there’s always a mess to come home to. As for not stockpiling, I’m with you on that as well. Looking forward to see if she publishes a new book now that she has a daughter.